R-Type Leo is much more forgiving than its predecessors because if a player dies, the ship will immediately return instead of starting at the beginning of the level or checkpoint. If the ship has Psy Bits when he died, a laser crystal will be dropped and the player can get his psy bits (but not their weapon) back. 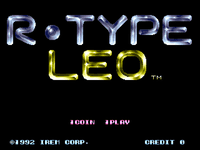 R Type Leo is the first game in the series to allow 2 players to play simultaneously. Source: Wikipedia, "R-Type Leo", available under the CC-BY-SA License.